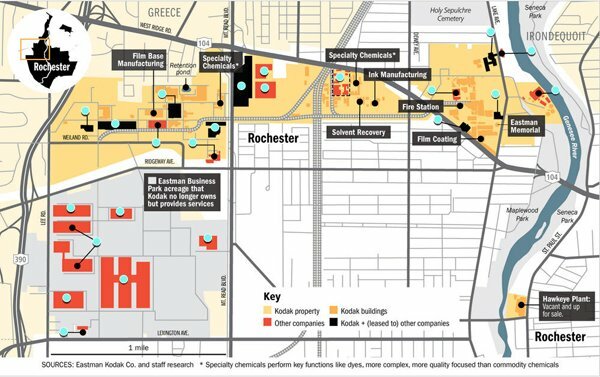 An interesting website developed by a local newspaper charts the history of Eastman Kodak Company’s 1,200-acre research and manufacturing facility in Rochester, NY – the former Kodak Park. The website talks about a time when Rochester called itself the “World’s Imaging Center,” and people pointed to Kodak Park as the iconic center of that universe. A large interactive map highlights many of the buildings on the sprawling campus, and describes in both words and pictures each building’s function through the years. Today, the campus is called Eastman Business Park, home to a growing number of companies not named Kodak, but who nonetheless are taking advantage of the Park’s unique infrastructure and facilities to advance science in the areas of thin films, biofuels and energy storage. The website points out that, as the “new” Kodak continues to emerge, the new Eastman Business Park is continuing to evolve, serving as the catalyst for the commercialization of new technologies and products in the materialsscience space. The legacy that was Kodak Park is not lost on this next generation of innovators. They include a solar technology firm, a company that converts carbon dioxide into polymers, a battery and energy storage commercialization center, and a company that is making sensors for a variety of touch applications.